Mountain Harvest RAW Pine Pollen Powder is additionally available in a 1/2 kilogram pouch and as capsules. Our first product. 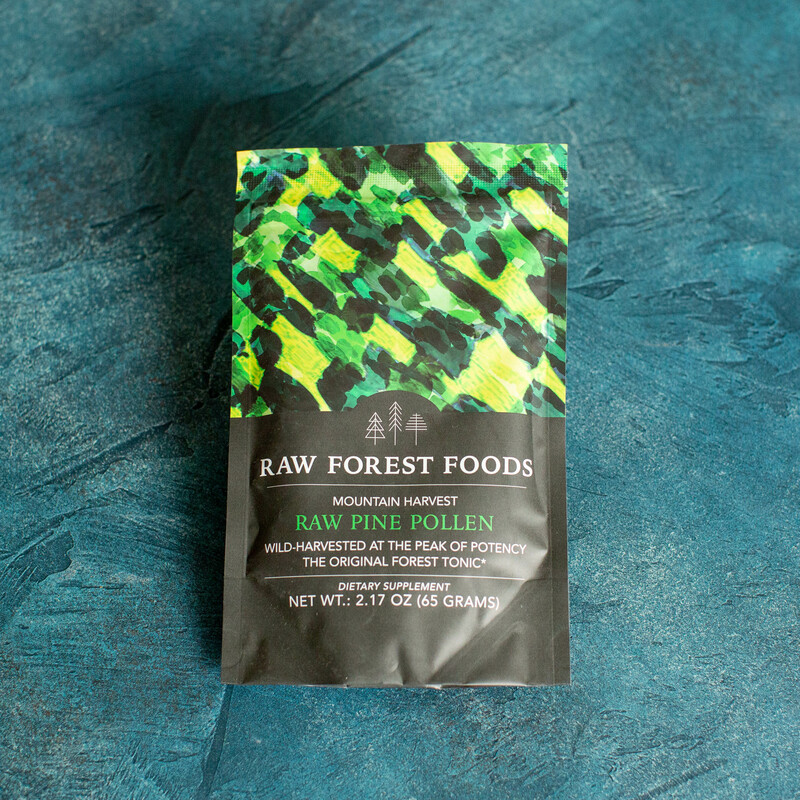 In 2010, RAW Forest Foods was founded with the single intent of providing high quality, high integrity Pine Pollen. At this time there was no domestic source for Pine Pollen, and after observing the healing potential that it held, we had to share it. Over half a decade later, we are pleased to be the premier source for Pine Pollen and proud to offer our customers the complete Mountain Harvest Pine Pollen line of products. Deep in the remote wilds of the foothills of the Himalaya, our Pine Pollen is harvested by hand from select Pinus massoniana pine trees. Working with a forest conservation co-operative, we use our long-standing relationships to bring our customers only the highest quality Pine Pollen available. Each spring, as the plants bloom to life, the catkins of the pine trees wake up and blanket the forest floor with high nutrient pollen. More than simply pollinating pine trees, pine pollen provides a source of valuable nutrients and growth hormones to assist the rapid spring growth of the areas sounding the trees and wherever the pollen travels to. Pine Pollen contains over 200+ identified beneficial compounds, including living nutrients and vitamins, all essential (and many non-essential) amino acids, vital enzymes and co-enzymes, many naturally occurring minerals, and healthful fatty acids. Additionally, Pine Pollen contains the pro-androgenic phytosterols and adaptogenic compounds many are looking for. In its unprocessed state, Pine Pollen is largely indigestible by humans—the rigid cells walls simply cannot be broken and thus the nutrients are locked inside and pass freely through the digestive tract. Using a low temperature, air fracturing method, our RAW Pine Pollen is processed to crack the cell walls, rendering Pine Pollen more than 99% digestible (as seen in laboratory studies). From RAW Forest Foods, the first company to bring Pine Pollen to the US and the leading authority on tonic and pro-androgenic herbs. View our RAW Pine Pollen 65 Grams and RAW Pine Pollen 500 Grams quick facts PDFs. Our select Mountain Harvest Pine Pollen Powder is available in 65 and 500 gram (1/2 kilogram, 1.1 pounds) pouches. and as vegan/vegetarian capsules. Additionally, RAW Pine Pollen can be found in our Pine Pollen Capsules, Pine Pollen Tablets, and Pine Pollen + Lion's Mane Tablets—all part of the Mountain Harvest Pine Pollen Collection. Each pouch contains either 65 or 500 grams of RAW Pine Pollen (from our Mountain Harvest collection). The dark, opaque outer pouch protects the ingredients from damage and degradation by UV rays and helps to keep the contents dry. Inside you will find an additional re-sealable package, again to help promote freshness. All RAW Forest Foods packaging is food grade and done domestically in our certified organic, FDA cGMP facility. We have selected to employ pouches for the packaging of our herbal powders because they require only a small fraction of the resources that larger bottles or jars do. In each 65 gram pouch, there are approximately 32.5 servings of RAW Pine Pollen Powder. 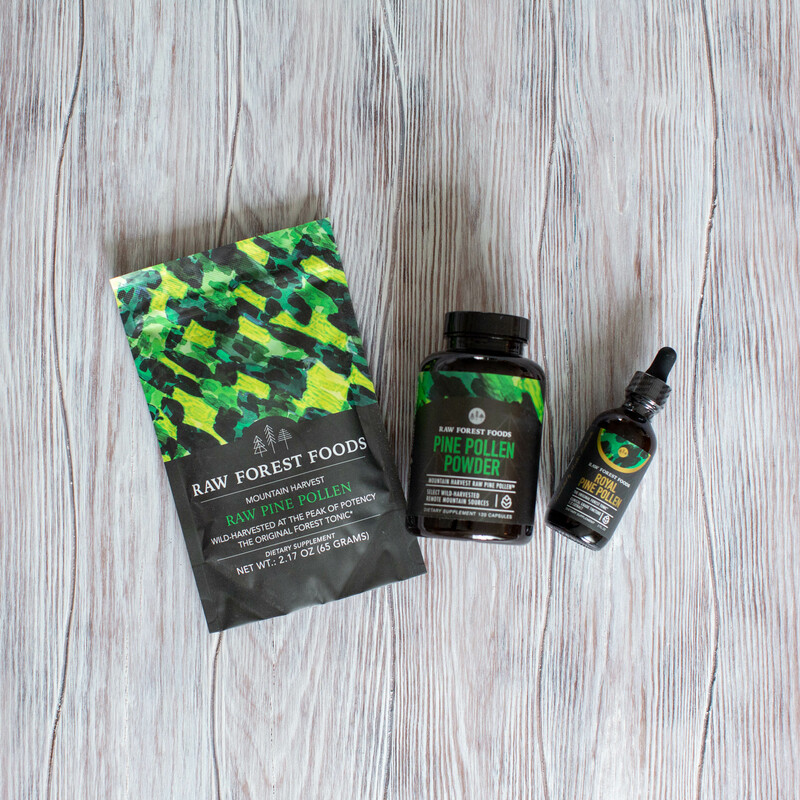 At RAW Forest Foods, our favorite way to use this product is simply to combine it with 4-6 ounces of fresh, cool water, and consumed on an empty stomach. The less heat used the better. I have bought and compared this to biofinest freeze dried pine pollen and find this stuff to smell better, taste better and absorb better. I do not like the fact that it is cell wall broken and would prefer it intact because increased acidity in the body but is otherwise the best on the market. Remember to always look for unheated products as raw can legally not mean what you think it means. Great product the best in the marketplace for natural overall body rejuvenation. I'm 49 yrs young and with this product feeling and being younger by the day. My workouts and bike riding activities are on point and my performance has greatly improved. I've purchased Raw Forest pine pollen several times and have always been very happy with the quality. I like the way I feel when I use pine pollen 5 days on and 2 days off. I feel a mental clarity and increase in energy when I use it in this way. Wonderful product. I make a tea with 1 tsp. PPP and 1/2 tsp. Cistanche (all from Raw Forest of course). I drink this first thing in the morning and as soon as I return home from work, both on an empty stomach. Been doing this for about a week and have definite rise in energy and mental clarity. I may be tired at the end of the day but then realize I have done much more in the evenings than usual. More and prolonged energy during the day too. I like it! Never had ED, but do notice increase in libido as well. First of all, I like getting my natural pine pollen from a trusted , reliable source, like Raw Forest. What I did with this order, my first one, was rather unorthodox. I " tinctured " it myself. Not really, though. I just soaked the contents of two 65 gram pouches in grain alcohol, in a quart jar, 1 1/2 cups. Then I added two cups water. Now its at 65 ? proof, down from 151 proof , and of peanut butter consistency. Each morning, I take out a heaping teaspoon, spread it out on a saucer, to let some more alcohol evaporate . After an hour, i can then use it between my cheek and gum, like tobacco chew ( the powdered stuff ) , without it stinging from the alcohol. There's still alcohol in it. It's best to have some leftover semi-alcoholic paste from the previous day, to immediately use. I've only been doing this for a week, and can notice a difference. But for a proper experiment there needs to be more people trying this out. Then we'll know for sure what the potential of this method is. So you treat the paste like" chew", by taking an almond sized nugget ( it's fairly dry, like bread dough or clay) , and placing it between cheek and gum and leaving it there to dissolve. I spread it out wider with my tongue. I'm 68, in good shape, apart from my prostate. So I'm looking forward to continued results. Will update in a month. Very happy with the shipping time. I started taking it 3 days a go. I feel satiated after taking it. I got it because I have allergies to pine tree pollen and I think this is going to help me get ride of it. What I am able to say is that it has a tremendous nutritional value, and it seems that my allergies are decreasing in intensity. I feel stronger and already saw increase in muscle quality. I take 1 gram a day with water in the morning. Thank you for offering such a great quality product!